What's remarkable, Michael, is that we know we are being seduced and tricked but allow it! So how and when did you come make this picture. 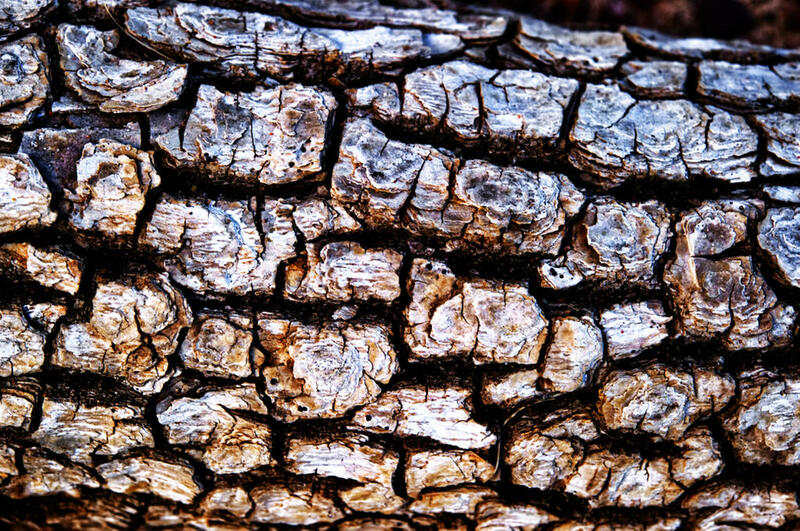 I am interested in knowing whether you own the wood!! Where was this and what led to the picture? I would have upset my wife insisting on schlepping it home! Hi Asher. 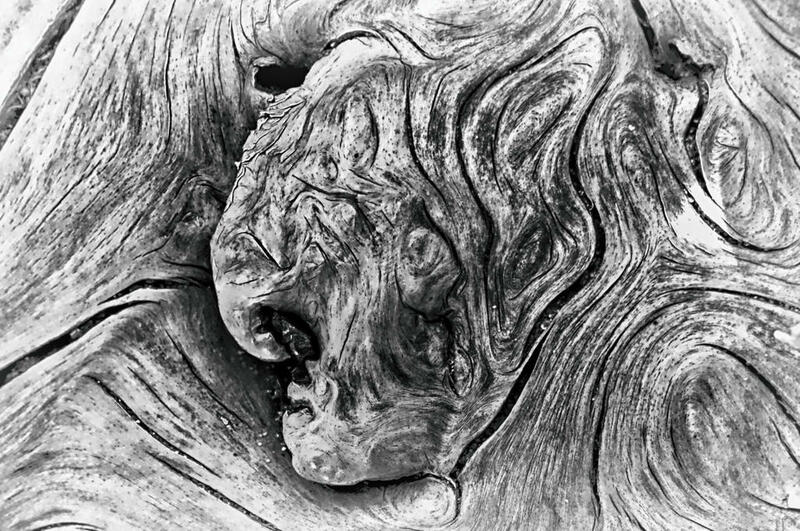 It's a piece of driftwood photographed at Wisconsin Point, Superior, a couple of weeks ago. Shot with a Nikon micro-60mm. The subject of the photo provoked me to investigate pagan female goddesses, which was instructive. This one is at the 'crone' stage of a goddess diety based on age and function. The term 'crone' derived from 'crown' to indicate wisdom in earlier centuries. The change indicates how ageist we have become since those days. Here's another driftwood photo from the same shoot. I'm not sure about a title but my wife thought the image looked like internal organs. To me, it looks like gold nuggets. Yes, for sure, Michael, They are nuggets! But it would simply “demand” to be possessed and taken home! Clear the cache of your browser or just switch to another one! Meanwhile I will send it to you! Here's one that you couldn't carry home, Asher. 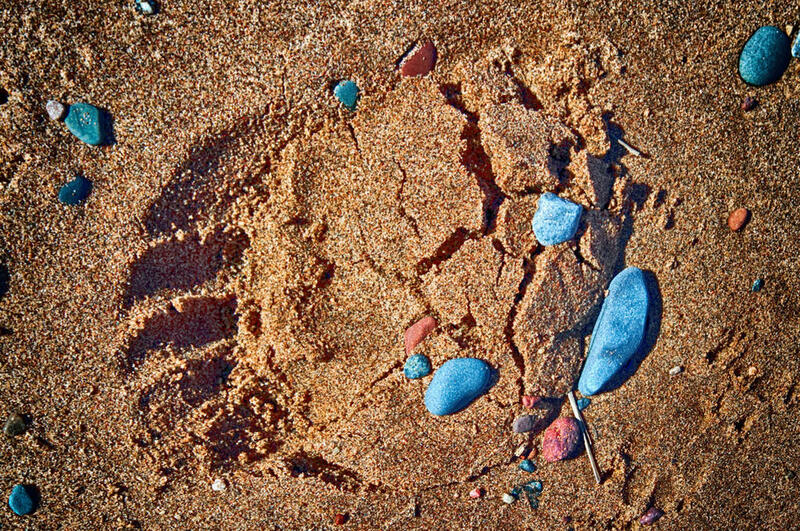 Most likely the pawprint of a large black bear that came to drink the superior waters of Lake Superior. Note the relative size of the traces of other animal prints (probably dogs) near the bottom left. Cheers, Mike. That is beautiful where it is! I wish I had seen it but then I would have been quite frightened, as would be the bear! The blue stone are fortuitous and add so much. What kind of mineral is that? Could it be sea-pounded granite fragments? Black bears are not that dangerous (unike grizzly bears). Humans just think they are. Twice when running in what we call 'the bush', my dog and I nearly collided with a black bear when rounding a 90 degree corner. The three of us resolved the situation happily by turning quickly and running back from whence we came. On another occasion, when camping, a black bear came to our site to inspect my tent. It pushed the canvas inward with its nose, stopping abruptly when its nose mine, with only a thinness of canvas between us. Evidently, the bear didn't like my smell because it quickly turned and ran away. Now that was scarey!